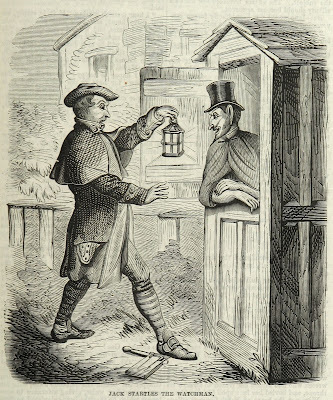 The street watchman was a familiar character to the inhabitants of Georgian cities and towns. Their job was to literally keep an eye on their designated section of roadway, as a defence against the common perils of crime and fire. In addition, they had the job of calling out the time and describing the weather. Because our urban nights are often ablaze with artificial light, it’s easy to forget how dark the streets were before electricity became abundant. Night watchmen had been on the streets of England’s towns and cities since medieval times. Artificial light was a precious commodity, supplied only by the flame, be it in the form of candle, brazier or oil lamp. When it was employed to illuminate a street, such forms of lighting had a limited range. Because huge patches of darkness made it easy for the criminally intentioned to move about unseen, watchmen were a necessary protection. 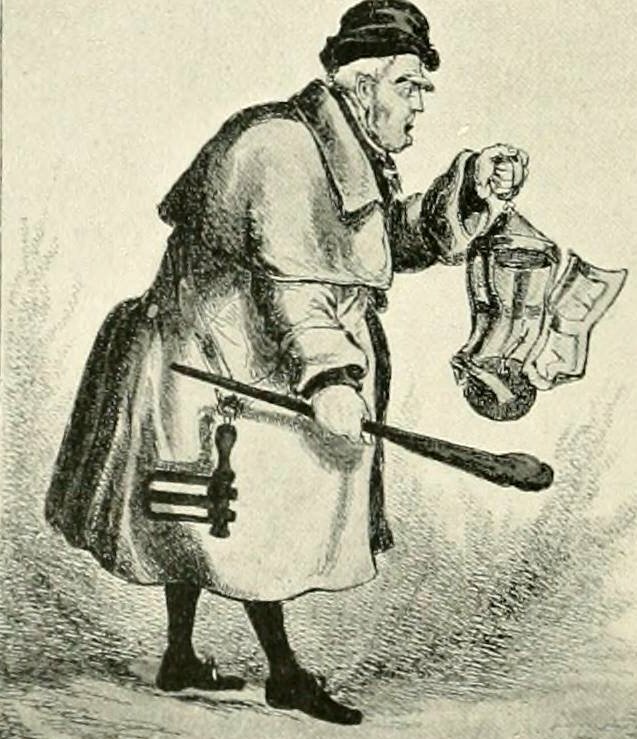 In London, early night watchmen were householders obliged to carry on the duty on a rota basis. In addition, Saussure noted that the watchman used his stick to push on shop doors, alerting the owner if it wasn't fastened correctly. In 1735, an Act of Parliament allowed the appointment of paid night watchmen in St James', Piccadilly, and St George’s, Hanover Square. 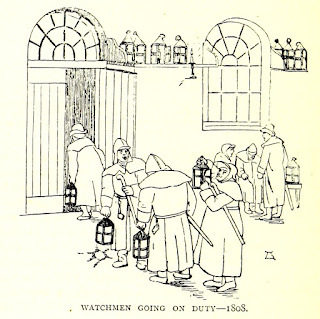 Many other Acts followed during the century, providing a system of paid night watchmen that covered most of London. The cost of the watch was passed on to householders through the rates they were obliged to pay the parish. The system of night watchmen in central London ended in 1829, with the creation of the Metropolitan Police. 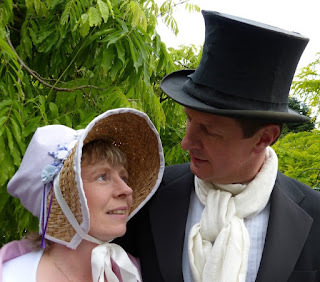 However, it was several years before police forces were established in other town and cities, meaning that in many part of the country, the night watchmen would have continued to serve well into the 1830s. How many of the first police officers would previously have done time in the watch? There’s was not a well-paid or highly respected role, and there seems to have been some concern that some watchmen were too friendly with the criminals they were meant to be watching out for. 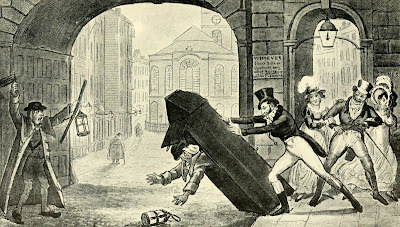 Indeed ‘Charlies’or 'Charleys', as watchmen were nicknamed, were caricatured in Georgian prints as often being asleep on the job, allowing criminals to take advantage. This image of the lazy, incompetent watchman goes back at least two hundred years to the time of Shakespeare, who made them comic figures in his play Much Ado About Nothing. However, at least some Georgian watchmen were not afraid to step in when they thought a crime had been committed. In 1796, John Wilson was stopped by two watchmen in Hanover Square, London, and taken to the constable who, on searching him, discovered pewter pots stolen from a pub. Patrolling the dark streets also meant responding to cries of alarm. On the night of 4 February 1795, at least two watchmen were called by a girl shouting “Watch and murder!” to a house near St Paul’s cathedral. On arrival they were threatened and chased off by an angry householder, John Dunn, who brandished two pistols and threatened to shoot the next watchman who approached his home. He was possibly drunk. It seems a number of watchmen were attracted to the commotion, perhaps drawn by a moment of excitement in what was often a dull job. So many came that Richard Fitzgerald, who patrolled the area that included the house, had to tell them to go back to their own beats. He also told some of them to stop using their rattle, as the noise seemed to aggravate Dunn. In his testimony at the Old Bailey some months later, Fitzgerald and other witnesses recalled that Dunn seemed very angry with the watchmen, continually cursing and threatening them as he wandered in the street outside his house. Dunn encountered a trainee watchman, on only his second night, and gave him a real fright by threatening him with the guns. The episode reached a climax when another watchman, Thomas Price, approached Dunn. For some reason Price was off his beat, perhaps unable to resist the sight of an armed man strutting a London street. Unfortunately, Dunn marched up to Price and, from a distance of just few inches, discharged one of his weapons. Price was killed instantly. Dunn was tried at the Old Bailey on 16 April 1795, found guilty of murder and sentenced to death. It’s not clear if this was carried out. 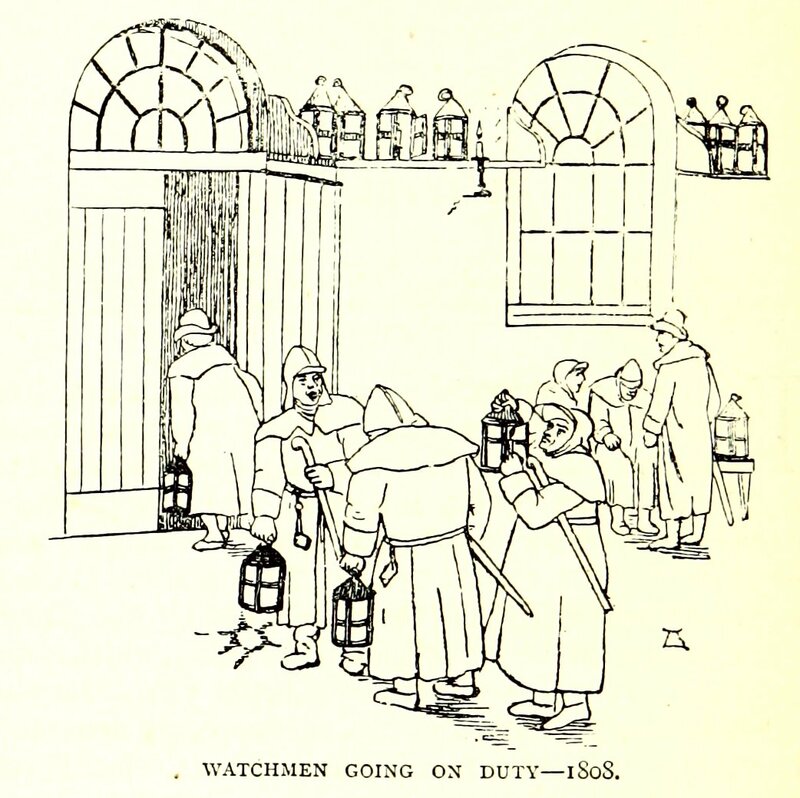 In 1735, when they established the first system of paid monitoring of the night time streets, St George’s hired 38 watchmen, four beadles and a watchhouse keeper. What sort of people were attracted to the job is not clear in the early eighteenth century, but nearly a century later, in the 1820s, many watchmen was ex-soldiers. It’s should be no surprise that then, as now, many military men took up jobs in the security sector. 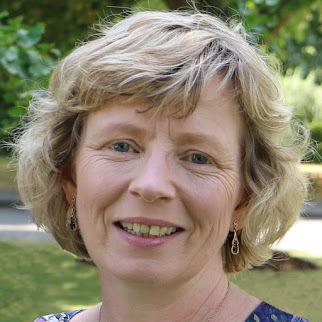 The beadle was in charge of the watchmen, responsible for ensuring they were on duty at the correct time and reporting any problems to the churchwardens. Typically, one beadle was on duty at a time. The watchhouse was the base from which the watchmen operated. It was their store, where equipment was kept, and could also act as a jail when someone needed to be detained. It was also where the watch book was stored, in which they made kept notes of their rounds. 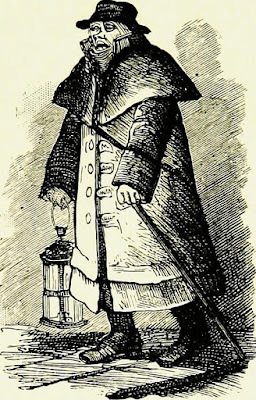 Contemporary illustrations of watchmen by Cruikshank and others show the typical items a watchman would have carried or used. Coat. It’s no surprise that a watchman would usually be wearing a long, thick coat. Even at the height of an English summer it can get chilly in the early hours of the morning. Hat. Every respectable, and even disreputable, Georgian had at least one hat. The watchman’s was less about fashion and more about practicality, having a wide brim to help against the rain on a damp night. Hut. The watchman’s hut, similar in appearance to a sentry box, would have been a familiar sight on urban streets. One of Cruikshank’s illustrations, from 1820, shows young men showing off to their ladies by tipping one over, complete with its hapless occupant. Lantern. Illustrations and written accounts suggest that candles were commonly used as a light source. Rattle. Watchmen carried a rattle, a wooden device that made a loud clattering sound when spun on its handle. In contemporary accounts, the action of using a rattle was variously described by watchmen as: ‘rung my rattle’, ‘swung my rattle’, ‘turned my rattle’, ‘played the rattle’ or ‘sprung the rattle’. Staff. A long wooden stick that could be used for self-defence or for prodding a sleeping drunk. 1. Cesar de Saussure, A foreign view of England in the reigns of George I and George II, (1902) p68. 2. Elaine A Reynolds, Before the Bobbies - The Night Watch and Police Reform in Metropolitan London, 1720-1830 (Macmillan Press Ltd, 1998) p24. 3. Dan Cruickshank and Neil Burton, Life in the Georgian City (Viking, 1990) p18.